Carl Ikeme who is down with acute leukemia after returning “abnormal blood tests” during pre-season testing at English club Wolverhampton Wanderers is enjoying so much goodwill across the world. Nigeria through the NFF are not taking the back seat in ensuring that Ikeme is not left alone in these trying times. 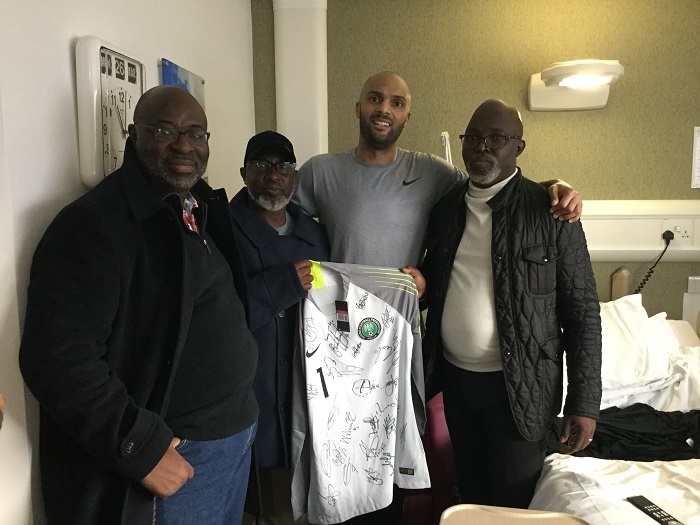 The NFF President, Amaju Pinnick led a delegation to visit the imposing goal –minder at The Christie Clinic in Manchester, where he is being treated. NFF 1st Vice President, Barrister Seyi Akinwunmi, General Secretary, Dr. Mohammed Sanusi, Super Eagles’ Team Administrator, Dayo Enebi, Eagles’ goalkeepers’ trainer Alloy Agu and team media officer, Toyin Ibitoye were all on hand to wish Ikeme well.